All of the terracotta orange paint is gone now (!! ), replaced by Sherwin Williams' "Sea Salt," a pale green-blue-gray that looks more green or more blue depending on the light. I painted the frame of the mirror above our mantel "Trinket" - which is a nice shade of deep gold - and the mantelpiece and bannister "Tricorn Black." 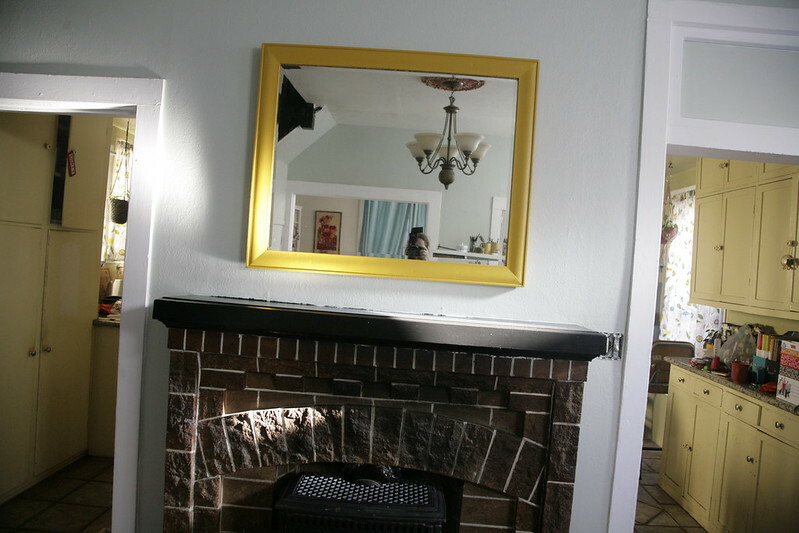 To be honest, I'm not sold on the black mantelpiece - I think I'll go back and repaint that a lighter color or white. The black is too ... slimming. Haha! But seriously, it looks out of proportion with the fireplace now and I want to repaint it. But not for a little bit, because I am tired of painting! I know you're wondering what room I will tackle next ... I do have some ideas, but I need a freaking break! The dining room is still a work in progress, and I did not completely refurnish it like I did the living room (because I spent all of my money on the living room! so it goes, haha), but I did do a few things, including switching out the curtains for some lovely mustardy-gold midcentury printed curtains from Cost Plus World Market. As you know, mustard yellow is one of my favorite colors, so I really wanted it to be the accent in this room. Now I can sew again! YAY! 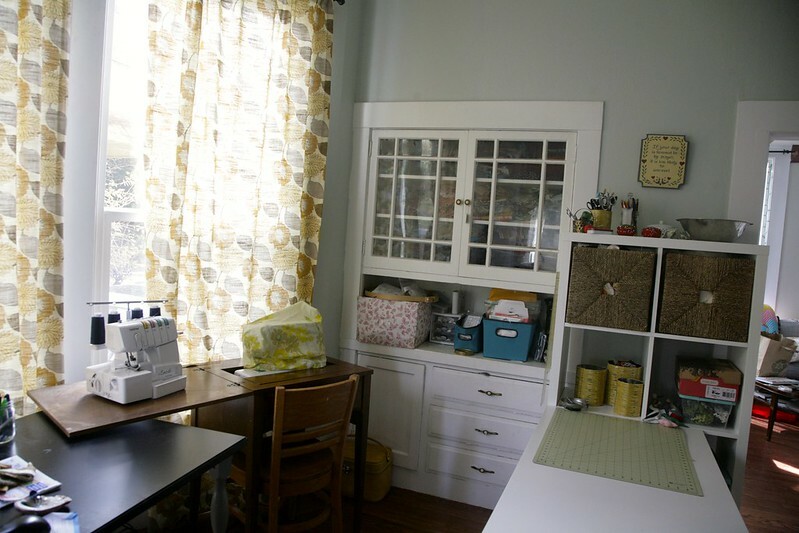 I actually really like having my sewing area in the middle of the action in the main living area of the house (this is good because I also don't have any choice!) but I fully admit - it is a small area and it is a struggle to keep it even reasonably presentable! Hopefully a little extra storage will help. We'll see. Okay, seriously? Who am I kidding? You guys know me! This will be a disaster zone in a week! But look! While I wasn't painting, I was crocheting! I just finished my first real crochet project after many hours of happily laboring on it while I watched movies and television with my family. It's one giant granny square. Quick and easy double crochet, worked around and around and around until it was a nice throw size (about 60" square). It's fast-going, although each row is slightly longer than the last, so it starts to feel less fast-going towards the end. Wait a minute ... where's Joe? AH! There you are Joe! All the ends are woven in now, and this afghan is going to be auctioned off to raise funds for the kids' preschool tonight! I used Vanna's Choice 100% acrylic yarn for this project - I got most of it on sale and while it's nothing fancy, it's machine washable and comes in lovely colors. 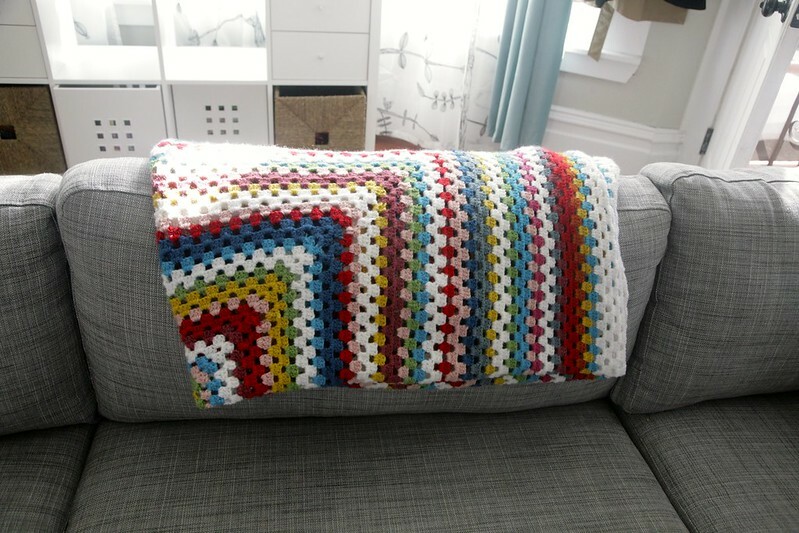 Perfect for a beginner project and perfect to snuggle under on the couch. It's a little tough saying goodbye to this one, but I know it's for a good cause! That's it for now! I'm working on some Christmas decorations now, hopefully I'll back soon to share those. Are you doing handmade decorations this holiday? Do tell. That blanket is so pretty! I would have a hard time giving it up, too! Your dining room looks great. 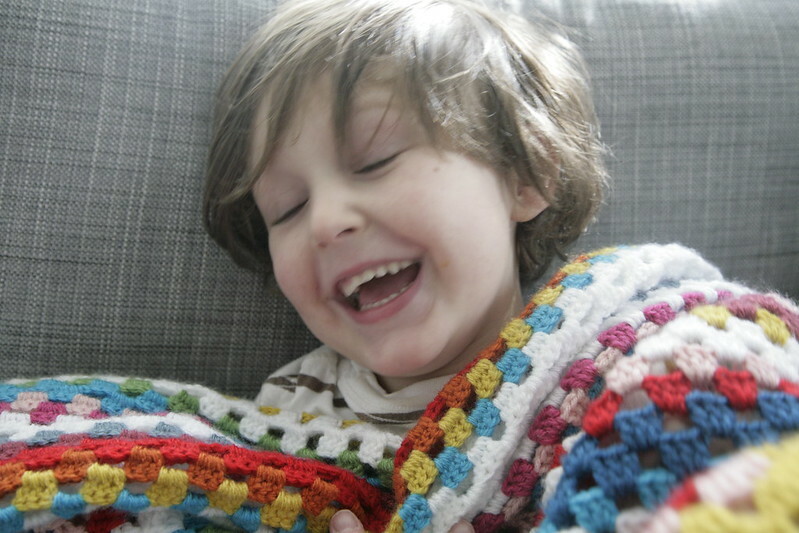 Ooh, love the crocheted blanket! I'm just learning to crochet at the moment. It takes me ages just to make one tiny square, so I can't imagine how long this project must have taken you... hope it raises heaps of money for the preschool. Love the colors in the blanket. I've never managed to crochet something this large. Must be very satisfying! Wow, Inder! I love the afghan, and the Sea Salt colour. Your house looks great. You're generous to give the afghan up: I'm not sure I could! I am loving that color you chose for the walls. It's so peaceful and it goes great with the white trim. It's amazing what a little paint will do! 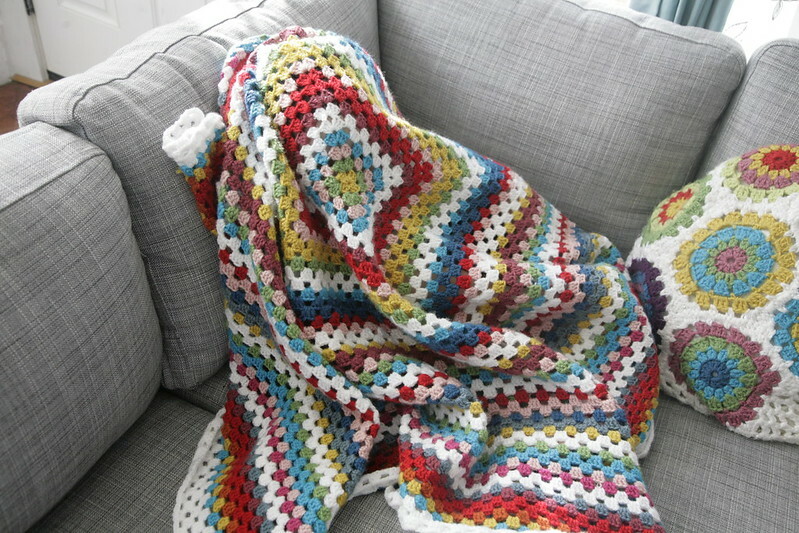 And that's blanket is pretty amazing! Whoever ends up with it is going to be one lucky lady (or man)! 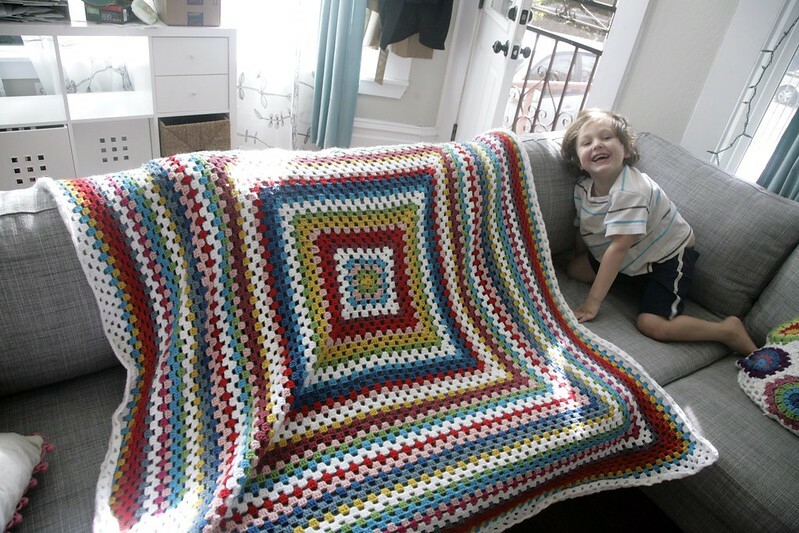 One giant granny square - what a great idea, rather than lots of little ones that need joining! I think I like the look of it better, too. 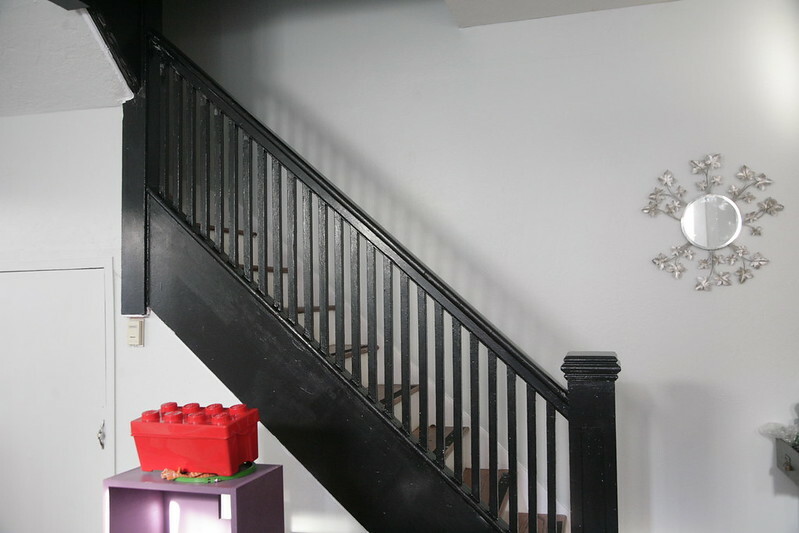 House is looking great, especially that bannister and the sewing space! Beautiful! 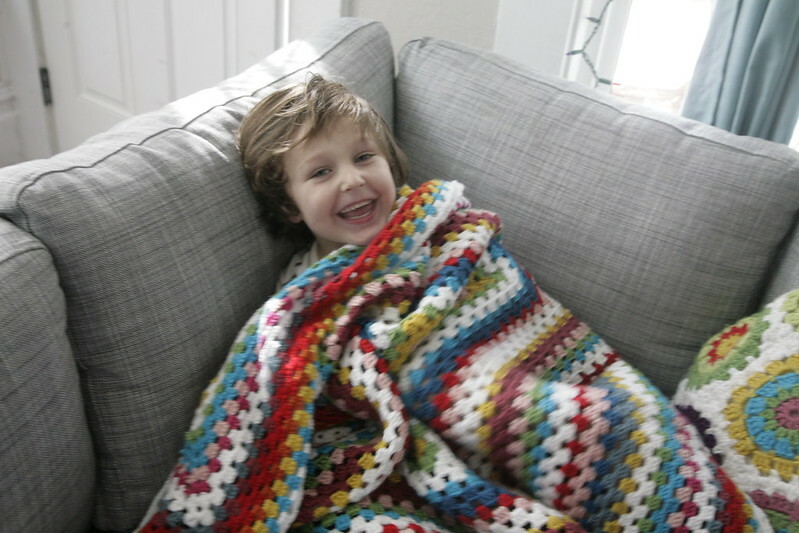 A crochet blanket is a good alternative to regular blankets since they are cheaper plus they are eco-friendly, too; especially if you choose them over electric blankets.